Rabbi Haim Druckman sharply criticized independent religious courts to circumvent the Rabbinate and conduct conversions. 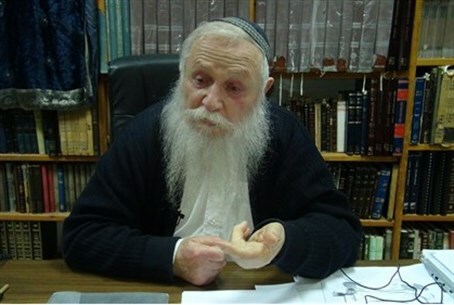 Rabbi Haim Druckman, considered the dean of Religious Zionist rabbis in Israel, sharply criticized the establishment of independent religious courts (batei din) that would circumvent the Rabbinate and conduct conversions on its own. According to sources, members of the group behind the project – led by Rabbi David Stav, head of the Tzohar organization, and Rabbi Nachum Rabinovich, head of the Birkat Moshe Yeshiva in Maale Adumim – met with Rabbi Druckman before publicly announcing the project, and were told by him that he thought it was a very bad idea. The group expects the majority of those it converts to be the children and grandchildren of families of immigrants from the former Soviet Union. Although they are Israeli citizens, many of these children are the products of “mixed marriages,” with their parents marrying in the Soviet Union and immigrating to Israel. Most of the children speak Hebrew fluently and serve in the IDF. That may be, said Rabbi Druckman, but the project, which overrides the authority of the Rabbinate, will open the floodgates to other groups who wish to override the Rabbinate, but for less idealistic reasons. “There are some who will conduct themselves properly under Jewish law, and others who will not. While it isn't a “revolution,” say its backers, the group is an innovation, conducting conversions that the Chief Rabbinate has preferred not to get involved with. Candidates for conversions by the court will undergo religious education at one of several institutions participating rabbis are involved with, with the support of the Jewish Agency. The Chief Rabbinate has not commented on the group's announcement. The group said that it would work with the Rabbinate on a case by case business to ensure that their conversion candidates are accepted as Jewish by all government agencies, where possible. In a statement Monday, Natan Sharansky. chairman of the Executive of The Jewish Agency, welcomed the establishment of the courts. "We all wish to continue the process of ingathering the exiles from throughout the world in an era of lost identities and growing assimilation,” said Sharansky. “In order to keep the gates of Israel open to all who wish to join our people in accordance with halakhah (Jewish law), it is important that rabbis who have been authorized by the Chief Rabbinate to conduct conversions participate in this process, and this new initiative will enable them to do so."